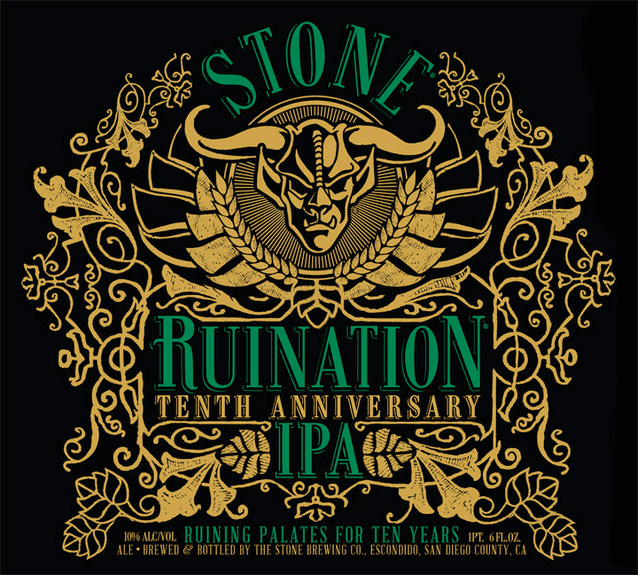 Stone Ruination Tenth Anniversary IPA was created as an homage to the almighty hop. 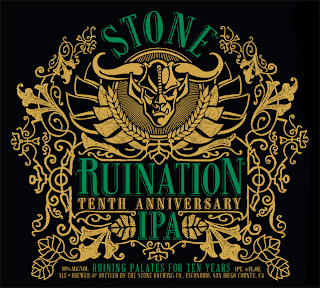 As the celebrated Stone Ruination IPA approached its 10th birthday this June, we knew we had to do something special, so we cranked it up from 7.7% to 10.8% and used twice as much hops–a whopping 5 pounds per barrel, including a pound each of Citra and Centennial in the dry hop. The results were GLORIOUS, but don't take our word for it. The only people more bitter than those who don't get any... will be those who do. Here it goes. A big beer in a big glass. The way it should be! - Nice dark copper brew, mostly clear with only the slightest haze. Big fluffy ruination-like bubbly head foams up to a couple of fingers, and then settles to a spotty misc-bubble mess with lace all about the glass, and a blanket of foamy bubbly madness over the madness. - Big citrus sweet hops. Dank dank fruity hops with a caramel roast. I think this beer is so big that the aromas are too much for itself. Nice sharp hop with a lovely spice. Almost burning the nose hairs with hops. Big caramel sweetness, bready and biscuit, and concentrated hop madness. Madness is the key word here. 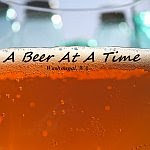 - Wonderful blend of malts, bready character, severe aroma hops... big citrus, spice, apple, grapefruit, zesty pine, grassy earth, and overall caramel sweetness. Surprisingly this has been done very well for such a big hitter. Hardly any alcohol flavors tho speak of. Truly a masterpiece. - Nice heavy body, not overly creamy at all though, and chewy as all get out. Nice dry bitterness without an overly sticky sweet aspect. I am amazed at the feel only because such big double IPA's are usually so sticky and cloyingly sweet. Not this bad boy. - I am already buzzing pretty good just from the lovely 'after-warmth' of just a few small pulls from this beer for this review. It's still relatively balanced for such a heavy number, while not showcasing any hard and sharp alcohol flavors. The body is great, the feel is great, and it is quite drinkable. This might be one of the better double IPA's as of late. 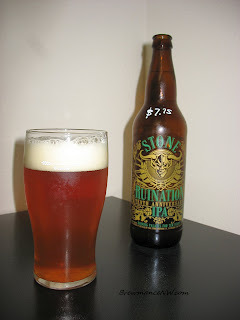 As if the regular Ruination wasn't already?